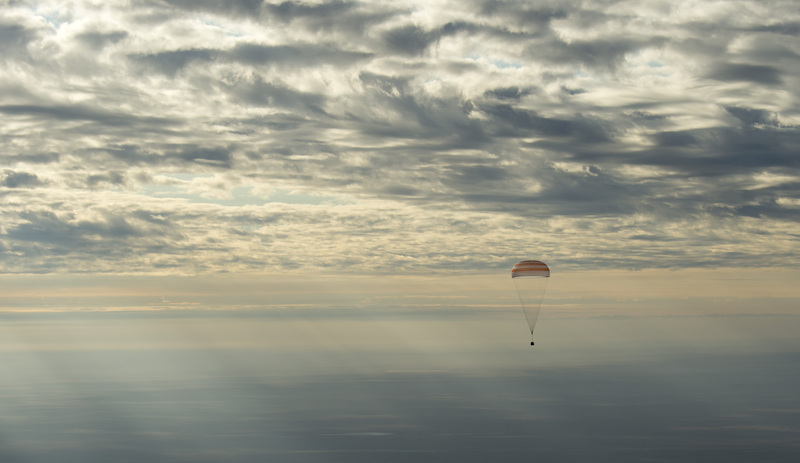 Three expedition crew members returned to Earth last night via their Soyuz MS-01 spacecraft. The trio, each hailing from a different nation and space agency, set down at 9:58 a.m. local time on Oct. 30 (03:58 GMT; 11:58 p.m. EDT Oct. 29) in Kazakhstan. The crew consisted of Russian cosmonaut Anatoly Ivanishin, Takuya Onishi of the Japan Aerospace Exploration Agency, and NASA’s Kate Rubins. During their time on the space station, the trio served as members of the Expedition 48 and 49 crews. With all these tests and checks behind, Ivanishin was cleared to hand command of the ISS over to NASA astronaut Shane Kimbrough in a traditional Change of Command ceremony that took place on Friday. Bidding farewell to Kimbrough and Russian cosmonauts Sergey Ryzhikov and Andrey Borisenko (scheduled to stay in space until February 2017), the returning crew entered the Soyuz spacecraft at 5:12 p.m. EDT (21:12 GMT) on Saturday, Oct. 29. Then Borisenko closed the hatch of the Rassvet Module, enabling a three-hour-long sequence of leak and pressure checks needed to prepare the vehicle and its crew for leaving the ISS. Shortly after detachment at 8:35 p.m. EDT (00:35 GMT on Oct. 30), the Soyuz conducted two separation burns within a six-minute time span. These two burns were required to perform a roll maneuver and set up the nominal departure path. Drifting away from the ISS, the Soyuz capsule started its two-hour-long fly-around of Earth, during which it completed a one-and-a-half orbit of our planet. This phase of manual flight was used to transition the vehicle to a tail-first orientation and open up the protective cover of its main engine utilized for braking maneuver during descent. The deorbit burn of this engine commenced at 11:06 p.m. EDT (03:06 GMT on Oct. 30) and lasted for four minutes and 37 seconds. The maneuver was needed to slow down the spacecraft and to set a re-entry trajectory toward landing in the designated area. The Soyuz vehicle split into three different modules at 11:33 EDT (03:33 GMT on Oct. 30) at an altitude of about 87 miles (140 kilometers). The Descent Module carrying the crew started another braking maneuver, commencing a controlled descent, while Orbital and Service Modules burned up in the atmosphere. The atmospheric re-entry of the crew began at 11:36 EDT (3:36 GMT on Oct. 30) at an altitude of approximately 62 miles (100 kilometers). The Soyuz capsule opened its parachutes at an altitude of 6.7 miles (10.8 kilometers) at 11:44 EDT (03:44 GMT on Oct. 30) and touched down some 14 minutes later at 11:58 EDT (03:58 GMT on Oct. 30) in a remote area in the Kazakh steppe, southeast of the town of Zhezkazgan. After landing, the rescue teams opened the hatch of Soyuz and helped the crew disembark one-by-one from the spacecraft. Around 200 military servicemen, fourteen Mi-8 helicopters, an Antonov An-12, an An-26 aircraft, and 20 other planes including four search-and-evacuate amphibious aircraft, were on the site to secure the safe touchdown and post-landing activities. Now, Ivanishin will return to Star City near Moscow, whereas Rubins and Onishi are expected to board a plane to NASA’s Johnson Space Center in Houston. Rubins, who holds a degree in molecular biology, became the first person to sequence DNA on orbit. She and her fellow crew members had their work cut out for them; during their stay, they also had to serve as “space traffic” controllers. Launching at 7:45 p.m. EDT (23:45 GMT) Orbital ATK’s S.S. Alan Poindexter Cygnus spacecraft was sent aloft atop a newly re-engined Antares 230 rocket from the Mid-Atlantic Regional Spaceport’s Pad-0A. On board was some 5,100 lbs (2,313 kg) of cargo, spare parts, crew supplies, and experiments. For her part, Rubins helped grapple the enhanced Cygnus which was subsequently berthed to the ISS. Rubins’ second jaunt ‘outdoors’ on Sept. 1 was a little less exciting as her work involved installing two high-definition cameras and retracting a spare thermal control radiator. The space station is a busy place. Members of the Expedition 50 crew, including NASA’s Shane Kimbrough as well as Sergey Ryzhikov and Andrey Borisenko of Roscosmos, arrived at the ISS after a successful launch from the Baikonur Cosmodrome on Oct. 19, 2016. Another crew of international space-flyers is set to launch on Nov. 17, and they include NASA astronaut Peggy Whitson, European Space Agency (ESA) Thomas Pesquet, and Russian cosmonaut Oleg Novitskiy. Some 16 different nations collaborate on the International Space Station Program; parts of the space station have been in orbit since 1998. Too bad the nations earthside can’t follow the astronauts example, of peace, cooperation, for the betterment of mankind.